He was arrested in 2015 after four women and two children were found dead in Barwala's Satlok Ashram. Yet another case was registered against him after another woman was found dead in his ashram. HISAR: Self-styled godman and Satlok Ashram head Rampal was held guilty in two murder cases by a Hisar court on Thursday. Additional District and Sessions judge DR Chaliya pronounced the judgment via video conferencing as Rampal was produced in a makeshift court inside the Hisar Central Jail complex. The quantum of punishment will be announced on October 16 in the case regarding the deaths of four women and a child, and on October 17 in the other case involving the death of a woman. Rampal was charged for murder and criminal conspiracy in both the cases. The final arguments in the cases were completed on Monday. A total of 80 witnesses, including doctors who conducted an autopsy of the victims, deposed during the trial. 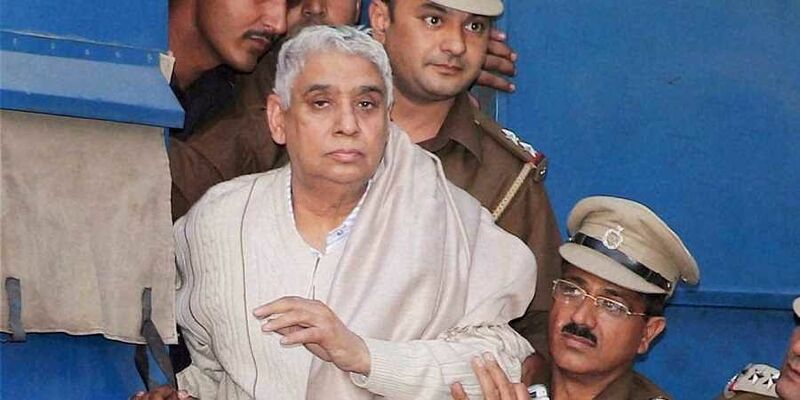 Rampal and his 27 followers were charged with murder and wrongful confinement after four women and a child were found dead in his Satlok Ashram spread over 12 acres, some three kilometres from Barwala town on Hisar-Tohana road in Hisar on November 19, 2014. Another case was registered after a woman was found dead in his ashram. "We will challenge this verdict before the Punjab and Haryana High Court. Last year, the court had acquitted Rampal in two other cases related to rioting, unlawful assembly and use of force,'' Satlok Ashram media in-charge Chand Rathee said. As a pre-emptive measure to check any violence by Satpal followers, the Hisar administration had deployed more than 2,000 police personnel, including six Superintendent of Police-level officers, besides the RAF and the STF. Prohibitory orders under Section 144 of CrPC were enforced in the district since Monday. In 2014, the Haryana Police faced a torrid time when it went to arrest Rampal following directions from the Punjab and Haryana high court over a contempt of court case. Thousands of Satpal followers clashed with the police. Authorities were forced to cut off power and water supply to evict the followers out of ashram. Rampal was arrested on November 19, 2014 on the charges of murder, attempt to murder, conspiracy, holding illegal weapons and abetting suicide. During the search operations at the Satlok Ashram, the police had confiscated a large cache of arms and ammunition, petrol bombs, chilli grenades, acid syringes and pregnancy test strips. Rampal is the head of religious sect called Kabir Panth and is popularly referred to by his followers as 'Jagatguru Rampal Ji'. The 63-year-old used to work as a junior engineer in the irrigation department in Haryana and left his job in 1996. Born at Dhanana village in Sonepat district, he is married and has two sons and as many daughters. The Satlok Ashram was founded in 1991 in Karotha village of Rohtak district. In 2006 during clashes between his followers and those of the Arya Samaj, one person was killed and 59 others were injured. Subsequently, the district administration attached these properties. He then moved to his another ashram near Barwala in Hisar. The ashram was closed after the clashes in 2014. At present, two of his ashrams are operating in Bhiwani and in Delhi.